This adorable temporary tattoo is a take off of our "Pretty In Pink" pink ribbon pin. This tattoo is 1 1/4" tall. Goes on easily with water and stays on for days. Great for your breast cancer awareness walks! Looks great on your arm, back, shoulder, face or leg. So inexpensive- you can buy them for your whole team! Also check out our Paisley Ribbon and Fight Like A Girl temp. tattoo. Price is per tattoo. 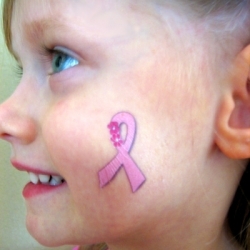 My team had these at the 2009 Seattle Breast Cancer 3 Day, and they are the best temp tattoos I've ever used. They are high quality and stay on for days! Will definitely get these again!